Dogs – and people – welcome here! Bryson City welcomes pet-lovers on vacation. We’ve got outdoor activities, live music and restaurants with outside seating. In summer, many downtown businesses have water bowls on the sidewalk. You’ll also find homemade dog biscuits on sale as a donation to PAWS, our no-kill animal shelter. You can find more than 100 pet-friendly accommodations by choosing the “pets allowed” amenity on our lodging pages. Please keep your dogs in check, clean up after them, and do not leave them unattended in vehicles or RVs. 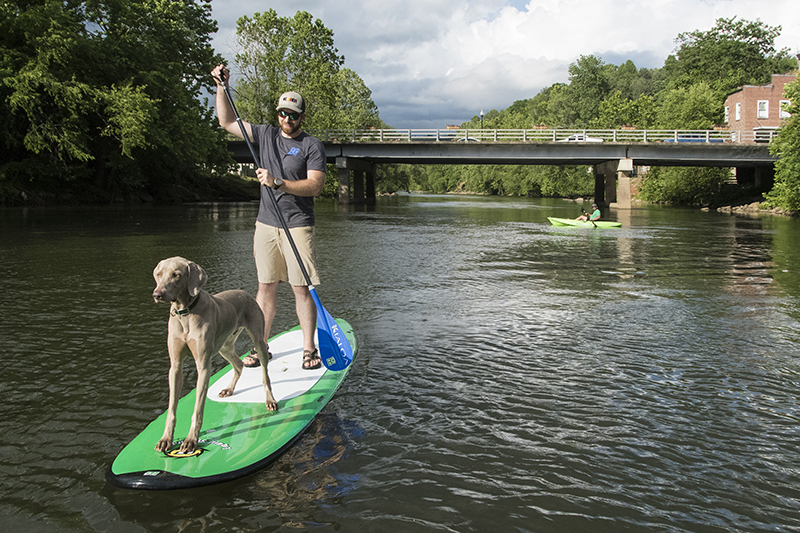 Paddleboarding on the Tuckasegee River in downtown Bryson City, or on Fontana Lake. Pontooning on Fontana Lake – all 3 marinas have some pontoon boats that are dog friendly. Watch family movies on a outdoor screen every Friday night at dusk, May – August behind the red caboose in Bryson City. Great Smoky Mountains National Park (GSMNP). Pets are NOT allowed on hiking trails in the GSMNP, except for the Oconaluftee River Trail, a 1.5 mile one way shaded path with beautiful views of the river. It begins at the Park Visitor Center in Cherokee. (There is also one Trail in Gatlinburg, TN) Deep Creek Recreation area just outside Bryson City in the GSMNP. Dogs are allowed in Deep Creek campground, picnic areas, and along roads (NOT on National Park trails), but must be kept on a leash (no more than 6 feet long) at all times. Bring the dog, the kids and a picnic to Island Park, located in the center of downtown Bryson City on the Tuckasegee River. The fishing is great there too. Take Everett St. to Bryson St. Cross the bridge to the park at the end of Bryson St.
Recreation Park — There is a walking trail in the Swain County Recreation Park just outside of downtown Bryson City. Take Everett St. to Depot St., then follow West Deep Road to the Park. Blue Ridge Parkway Trails. Waterrock Knob at milepost 451.2 – 1.2 mile trail one way (2.4 out and back). Restrooms, visitor center, and picnic area. Devils Courthouse at milepost 422. One way trail is 0.4 miles (0.8 out and back), climbs steeply, with exceptional views from the summit. Black Balsam and Tennent Mountain (Art Loeb Trail) at milepost 420.2. A series of unofficial, but well-defined paths run around the open summit of Black Balsam Knob. 1 mile to the summit, although hikers can continue for several more miles along the balds for 360 views of the Blue Ridge Mountains. Printable Pet Friendly Activities, Hikes and Walks pdf. Bryson City has a number of eateries and wineries/breweries with outdoor seating where dogs are generally allowed (note: some may allow smoking). Here’s a list, or look for the on the dining or wine/brew page.